Google has announced the names of most popular apps, games, movies, music, news and books of 2014 on Google Play. 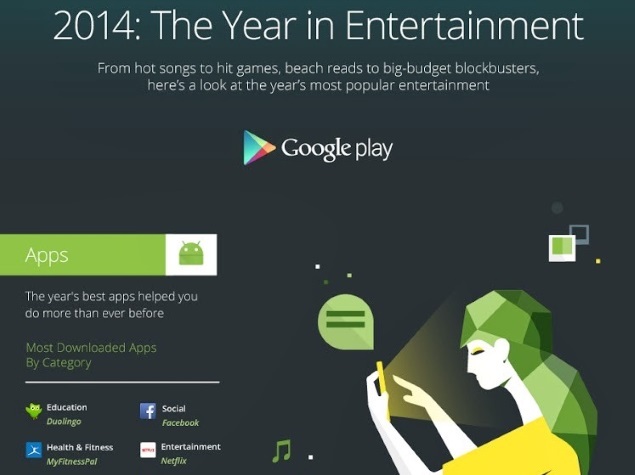 The Mountain View giant in an infographic titled '2014: The Year in Entertainment' has revealed some of the interesting downloads from Google Play this year. According to Google, the most downloaded apps by category are Education - Duolingo (a language learning app); Social - Facebook; Health and Fitness - MyFitnessPal (a calorie counter app); Entertainment - Netflix; Music - Pandora; Sports - NFL Mobile; Photography - Flipagram (for making short video stories), and Travel - TripAdvisor. The top downloaded games on Google Play include Candy Crush Saga, Don't Tap the White Tile, Farm Heroes Saga, Subway Surfers, and Clash of Clans. Google's movie of the year is Frozen, while the TV show of the year is The Walking Dead. The company's lists the Toy Story as comeback movie of the year. Interestingly, Frozen, apart from being the movie of the year, is also the album of the year with its original motion picture soundtrack. In 2014, Katy Perry's Dark Horse was the song of the year. Meanwhile, the song of the summer was Fancy by Iggy Azalea. The company also shortlisted news sources of the year which had The New York Times topping the chart followed by TMZ, Forbes Now, The Verge, The Huffington Post, The Daily Beast, The Wall Street Journal, Gizmodo, and Android Central. According to Google, book of the year is The Fault in Our Stars, followed by Fifty Shades of Grey, Divergent, Twelve Years a Slave, and Insurgent. Brian Irving, global director of marketing for Google Play announced the top list of 2014 in a blog post and pointed that the source is Google Play's internal data. With the year 2014 coming to an end, company's such as Twitter, Facebook and YouTube have also announced data gleaned over the course of 2014. First, it was Facebook that revealed its '2014 Year in Review' top 10 lists, and then Twitter rolled out a list of the most popular tweets and personalities in the year 2014. Lastly, Google unveiled its list of top trending YouTube videos of 2014 including from India.